The term keratoameloblastoma has been used to describe a heterogeneous group of odontogenic neoplasms, which have in common indisputable histological appearance of ameloblastoma and areas of extensive keratin formation. 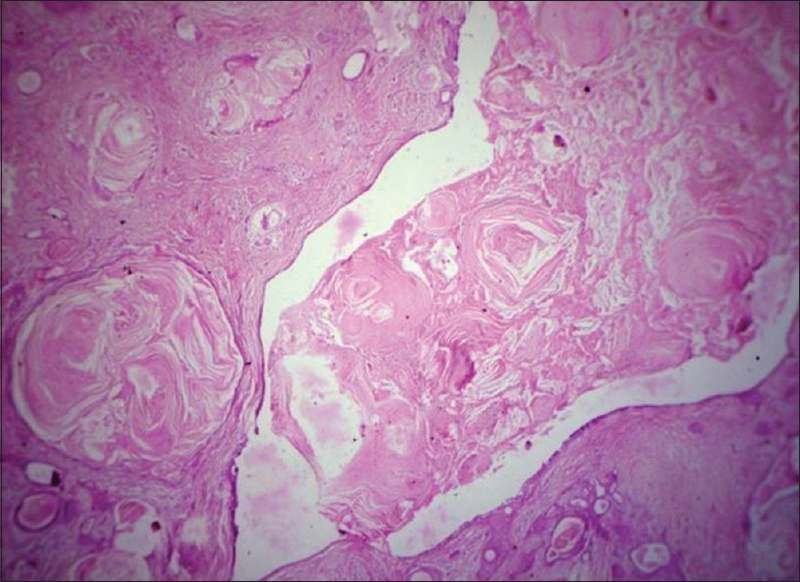 It differs from acanthomatous ameloblastoma, which also exhibits squamous metaplasia of the stellate reticulum (with or without keratin pearl formation), by the presence of keratin in the connective tissue stroma. Ameloblastoma is the most common odontogenic tumor, generally occurring in the intraosseous region of the jaws. However, it rarely appears in the gingiva or oral mucosa, known as peripheral ameloblastoma (PA), which comprises 1.3%–10% of all ameloblastomas. Our review of English language literature revealed cases of peripheral plexiform/follicular ameloblastomas, acanthomatous ameloblastomas, desmoplastic ameloblastoma  and granular cell ameloblastoma. The present case is probably the first case of a peripheral keratoameloblastoma to the literature. A 32-year-old female patient reported with a chief complaint of a swelling on the palate present for 3 years. Her history revealed that the swelling had gradually increased in size since its onset. Clinical examination revealed an ovoid swelling of approximately 4 cm × 3 cm in the left posterior palatal region [Figure 1]. The mass was firm and mucosa over the mass was smooth and erythematous. The swelling was not associated with pain, discharge, or paresthesia. Left submandibular lymph nodes were tender and palpable. No remarkable medical history was revealed except for hypertension. Orthopantomograph showed no evidence of any palatal bone pathology [Figure 2]. Thus, a provisional diagnosis after clinical and radiographic examination of a minor salivary gland tumor was made. All laboratory investigations were carried out and were found to be within normal limits before the surgical procedure. After taking an informed consent from the patient, surgical removal was done under local anesthesia without complications. A full-thickness mucoperiosteal flap was elevated, and a well-encapsulated mass was noted which easily separated out from the underlying periosteum. It was possible to remove the lesion in-toto and submitted for histopathological examination. Grossly, the specimen consisted of a mass of grayish-white tissue. The surface was rough and had a gritty texture when cut [Figure 3]. The tissue was then processed, and the sections were stained with hematoxylin and eosin (H and E) stain and immunohistochemistry using CK19 marker was also performed. H and E-stained sections revealed a solid, well-circumscribed lesion composed of a prominent collagenous and hyalinized fibrous connective tissue stroma supporting a proliferation of odontogenic epithelium. 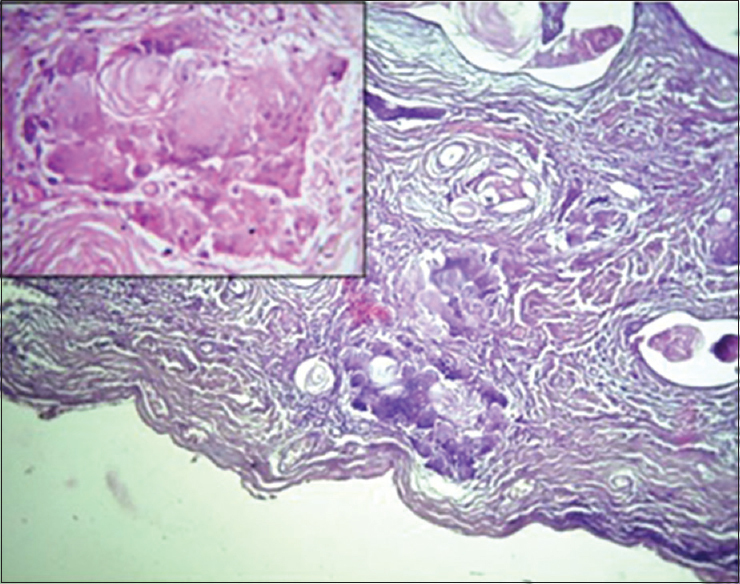 Within the stroma, multiple microcystic spaces lined by epithelium exhibiting the typical histologic features of an odontogenic keratocyst (OKC) were present [Figure 4]. The centers of some follicles were packed with layers of desquamated parakeratin [Figure 5]. The cells of the basal layer of the follicular structures were columnar and exhibited hyperchromatism and palisading with reversed polarity and subnuclear vacuolation, producing inductive effect in surrounding stroma [Figure 6] and [Figure 7] In addition, some ameloblastic follicles, anastomosing and plexiform ribbons and interconnecting cords of odontogenic epithelium were also seen. At the periphery of the tumor, there were collapsed cystic areas containing desquamated parakeratin, pacinian-like stacks of lamellated parakeratin [Figure 8]. 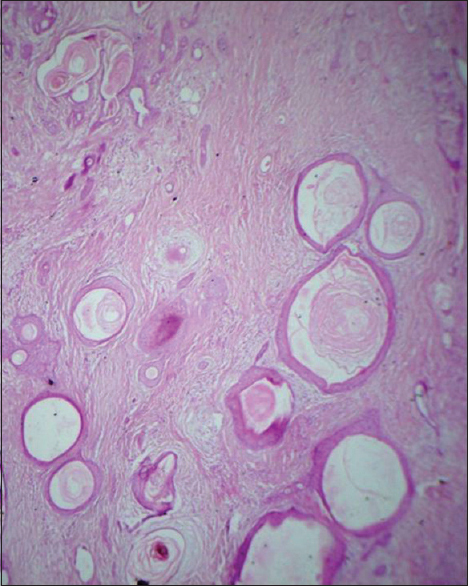 Due to rupture of some of these follicles, extruded parakeratin was seen in connective tissue stroma producing a foreign body giant cell reaction [Figure 9]. 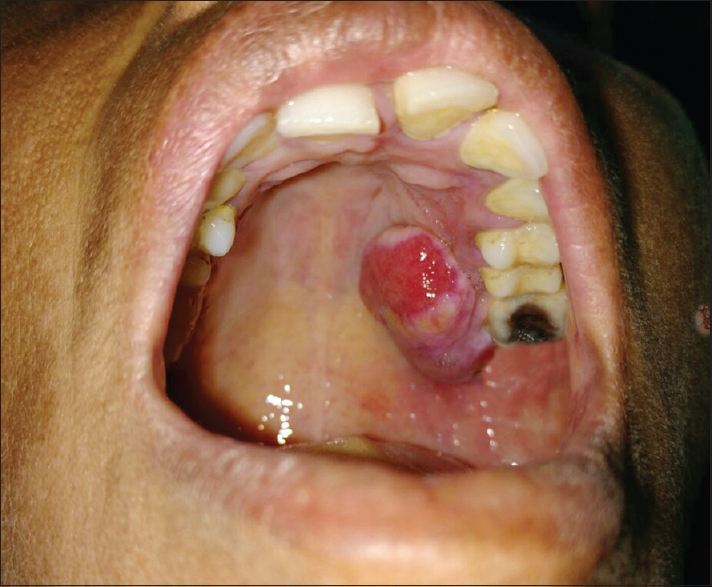 From histopathological features, confirmed diagnosis of keratoameloblastoma was given. Immunohistochemistry analysis revealed that many peripheral and central follicular cells showed affinity for CK19 which confirms its odontogenic origin thus supporting the proposed histopathological diagnosis [Figure 10]. On clinical and radiographical correlation, the lesion was finalized to be a peripheral variant of keratoameloblastoma. Keratoameloblastoma is a rare histologic variant of ameloblastoma. Only a few cases of keratoameloblastoma have been documented in the literature, all of them being intraosseous. In our case, keratoameloblastoma was present as a peripheral lesion which is to be reported for the first time in the medical literature to the best of our knowledge. The case being presented was diagnosed in a 32-year-old female patient as a posterior palatal swelling without involving the palatal bone. Since this case was considered as a novel case, it was not possible for us to compare it with the previously reported cases of keratoameloblastomas. No related studies were found establishing the pathogenesis; nevertheless, some theoretical explanations based on earlier studies on other related lesions are discussed here. The etiology of PA is unclear. The pathogenesis of PA has been discussed extensively with the most probable source of this lesion being remnants of the dental lamina, odontogenic remnants of the vestibular lamina, pluripotent cells in the basal cell layer of the mucosal epithelium and pluripotent cells from minor salivary glands. Whitt et al. 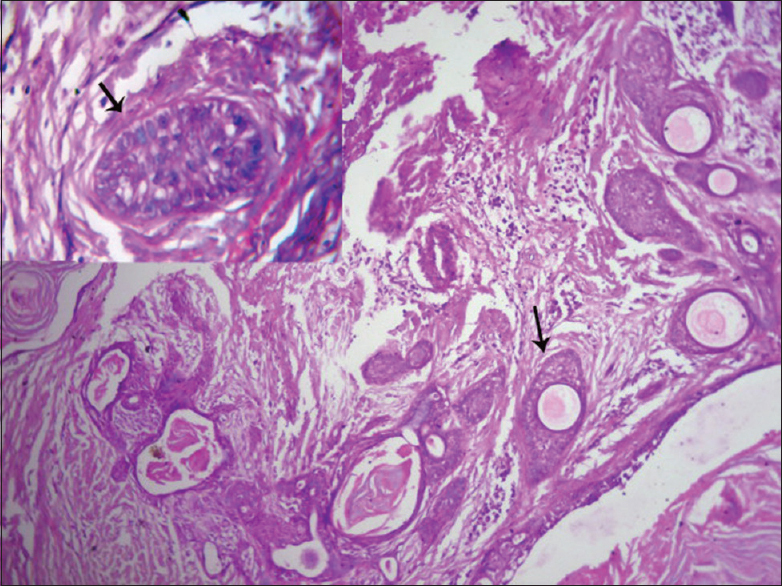 summarized the histologic features of intraosseous keratoameloblastoma into four main groups: (a) papilliferous, (b) simple, (c) simple with OKC-like features, and (d) complex. 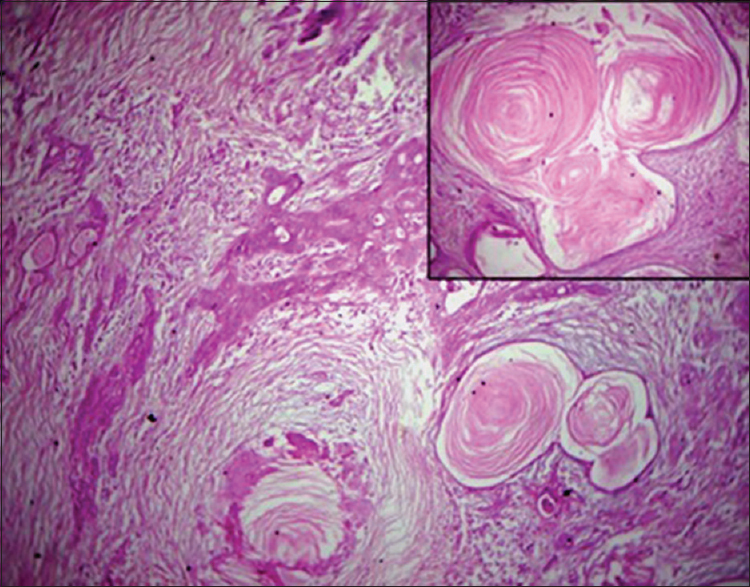 Our histologic diagnostic criteria were as follows: (a) variably sized cysts, with the epithelial lining suggestive of OKC filled with pacinian-like stacks of lamellated parakeratin; (b) extruded parakeratin in the collagenous, hyalinized fibrous connective tissue stroma producing a foreign body giant cell reaction;(c) solid epithelial follicles composed of central parakeratin and keratin plugs and peripheral “ameloblastic” epithelium; (d) ameloblastic follicles and interconnecting cords of odontogenic epithelium. 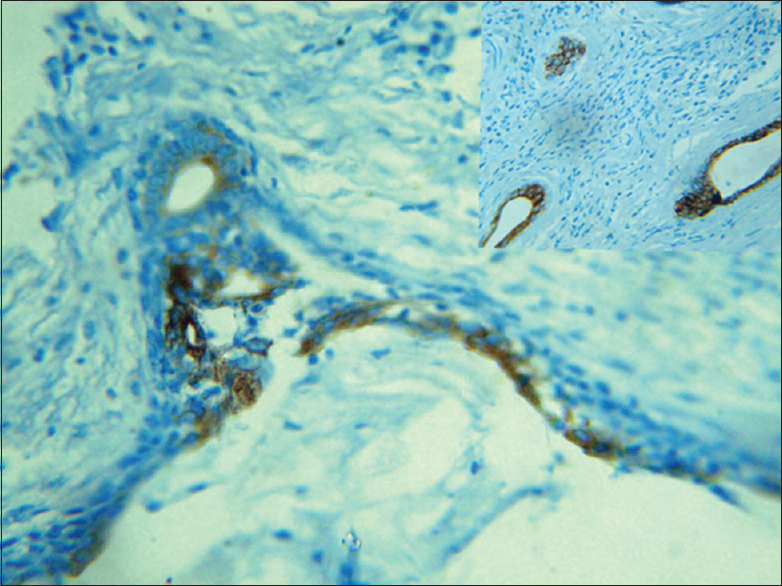 Immunohistochemistry using marker for CK19 (a 40 kDa cytokeratin, smallest in size) expressed positive results, confirming the lesion to be of odontogenic origin. CK19 is expressed by preameloblasts and ameloblasts of developing tooth germ and by stellate reticulum-like cells of ameloblastomas. 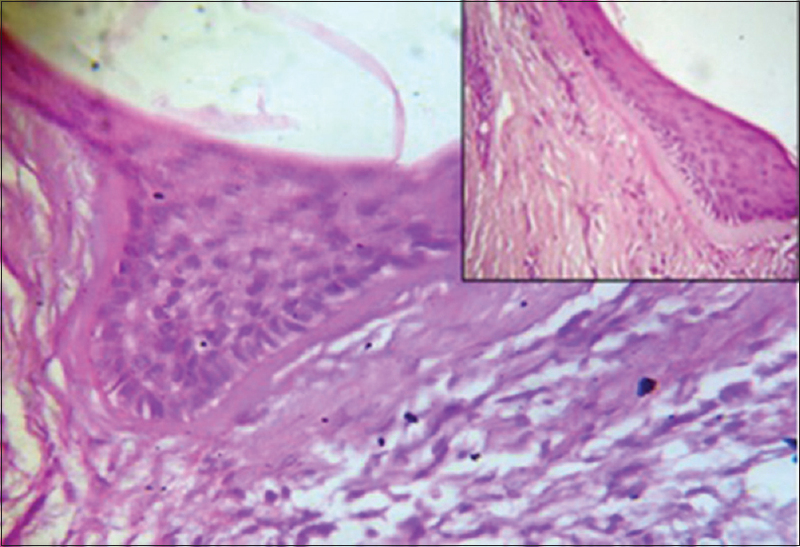 The present case was well encapsulated, peripheral lesion which was slowly growing and thus appeared to be less aggressive, in contrast to the clinical behavior of reported intraosseous variants. More such cases are welcome to perform molecular studies, define the clinical behavior and determine the treatment modality of peripheral keratoameloblastomas. The multiplicity of histologic subtypes has burdened the literature and confused clinicians. The clinical and histologic findings support our diagnosis of peripheral keratoameloblastoma, thus contributing a new set of lesions to the heterogeneous histology of ameloblastomas. The variations are of academic interest, allowing the pathologist to appreciate the histologic diversity, but biologic behavior is not affected by these variations. Gardner DG. Some current concepts on the pathology of ameloblastomas. Oral Surg Oral Med Oral Pathol Oral Radiol Endod 1996;82:660-9.
van Rensburg LJ, Thompson IO, Kruger HE, Norval EJ. Hemangiomatous ameloblastoma: Clinical, radiologic, and pathologic features. Oral Surg Oral Med Oral Pathol Oral Radiol Endod 2001;91:374-80. Palaskar SJ, Pawar RB, Nagpal DD, Patil SS, Kathuriya PT. Keratoameloblastoma a rare entity: A case report. J Clin Diagn Res 2015;9:ZD05-7. Said-al-Naief NA, Lumerman H, Ramer M, Kopp W, Kringstein GJ, Persenchino F, et al. Keratoameloblastoma of the maxilla. A case report and review of the literature. Oral Surg Oral Med Oral Pathol Oral Radiol Endod 1997;84:535-9. Whitt JC, Dunlap CL, Sheets JL, Thompson ML. Keratoameloblastoma: A tumor sui generis or a chimera? Oral Surg Oral Med Oral Pathol Oral Radiol Endod 2007;104:368-76. Sciubba JJ, Fantasia JE, Kahn LB. Benign odontogenic tumors. In: Rosal J, editor. Tumors and Cysts of the Jaws: Atlas of Tumor Pathology. 3rd series, Fascicle 29. Washington, DC: Armed Forces Institute of Pathology; 2001. p. 75-6. Gardner DG, Heikinheimo K, Shear M, Philipsen HP, Coleman H. Ameloblastoma. In: Barnes L, Eveson JW, Reichart P, Sidransky D, editors. World Health Organization Classification of Tumours: Pathology and Genetics of Head and Neck Tumours. Lyon: IARC Press; 2005. p. 297-8. Neville BW, Damm DD, Allen CM, Banquet JE, editors. 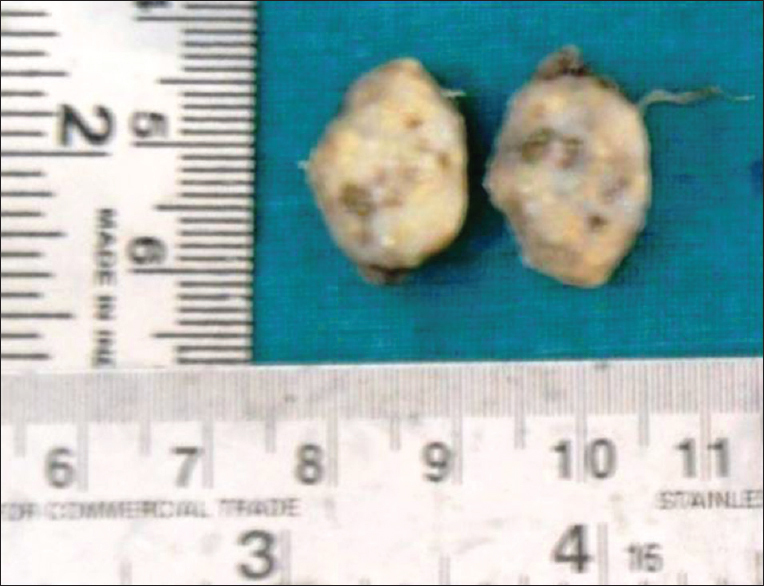 Odontogenic cysts and tumors. In: Oral and Maxillofacial Pathology. 3rd ed. Philadelphia, PA: Saunders, Elsevier; 2009. p. 710. Yadav R, Gulati A, Sharma R, Narain S. Peripheral ameloblastoma: Review of literature and case presentation. Indian J Multidiscip Dent 2011;1:135-9. Bologna-Molina R, Mosqueda-Taylor A, de Almeida-Oslei P, Toral-Rizo V, Martínez-Mata G. Peripheral desmoplastic ameloblastoma: Histopathological and immunohistochemical profile of a case. Med Oral Patol Oral Cir Bucal 2010;15:e846-9. Maria A, Sharma Y. Granular cell – Peripheral ameloblastoma: A rare variant. J Maxillofac Oral Surg 2009;8:294-7. Siar CH, Ng KH. 'Combined ameloblastoma and odontogenic keratocyst' or 'keratinising ameloblastoma'. Br J Oral Maxillofac Surg 1993;31:183-6. Sabrina N, Delmira A, Gabriel T, Alvaro M, Adalberto MT, Ronell BM. Cytokeratins 14 and 19 in odontogenic cysts and tumors: A review. Odontoestomatología 2014;16:44-55.